Delve inside a nested series of animals, but be careful not to starve in the process. Playable in the browser. If you prefer a standalone, builds are available for Windows, Mac, and Linux (untested). Follow the yellow arrows to find victory. If you're not on the right track, you'll see an arrow next to the depth indicator letting you know that you should make your way back out. When your satiety meter is empty, you'll automatically eat one of the foods inside you. If you have no food to eat at that moment, you'll starve and die!! Move the mouse cursor over an object to see what it is. b: Bash something in the specified direction, pushing it away. 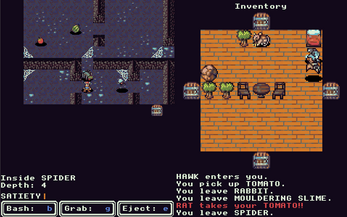 g: Pull something in the specified direction into your inventory. e: Push out something that's next to the specified door in your inventory (e.g. e + up will push out the object by your north door, if any). Basic tile rendering engine and ECS framework were created in Unity prior to the start of the 7DRL challenge. Thanks to my friends for lots of playtesting prior to release. Thanks for playing! Don't hesitate to leave feedback of any kind. Ate the tomato. Excellent submission. This game is just so different from anything i have ever played before! It is a very strange journey. I had so much joy exploring these inner worlds! I reached a depth of 10, but on the wrong way. Is there any way to get the animals out of your inventory? I'm so glad to hear you enjoyed it! As for getting animals out of your inventory, if you wait long enough, they'll eventually get bored and leave on their own. 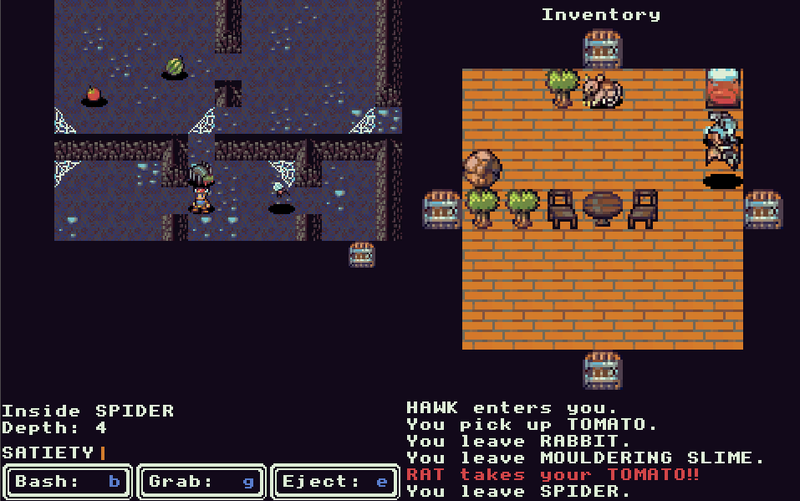 Otherwise, you might be able to chase them out by having a dog in your inventory (some animals are afraid of dogs, and dogs won't take your food). Thank you for your explanation. I think I have to give it another go and try to get some dogs inside of my inventory this time. this game is so strange and lovely! playing was so much fun! Strange and lovely is high praise. Thank you!